Renal cell carcinoma (RCC) was recognized as an immunologically sensitive cancer over 30 years ago. The first therapies to affect the course of RCC were cytokines (interferon alfa-2B and interleukin-2). Subsequently, drugs that inhibit HIF (hypoxia-inducible factor)/VEGF (vascular endothelial growth factor) signaling demonstrated overall survival advantages (tyrosine kinase inhibitors and mTor inhibitors). In the last 3 years, the immune checkpoint inhibitors (ICIs) have become the standard of care treatments in the first and second lines for RCC. Emerging data show that combinations of ICI, HIF signaling inhibitors, and cytokines are potentially powerful regimens. How to combine and sequence these types of therapies and how to integrate new approaches into the management of RCC are now the key questions for the field. Treatment of RCC is likely to change dramatically in the next few years. Bryden Considine declares that he has no conflict of interest. Michael E. Hurwitz declares the following disclosures: (1) Advisory Boards/Consulting: Nektar Therapeutics, Janssen Pharmaceuticals, CRISPR Therapeutics; (2) Research: Apexigen, Astellas, AstraZeneca, Bayer, Bristol Myer Squibb, Clovis, Corvus, Eli Lilly, Endocyte, Genentech, Genmab, Innocrin, Iovance, MedImmune, Merck, Nektar Therapeutics, Novartis, Pfizer, Progenics, Roche Laboratories, Sanofi Aventis, Seattle Genetics; and (3) Other: Gamida Cell. Hammers HJ, Plimack ER, Infante JR, Rini BI, McDermott DF, Lewis LD, et al. 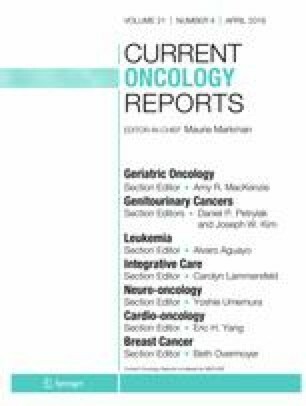 Safety and efficacy of nivolumab in combination with ipilimumab in metastatic renal cell carcinoma: the CheckMate 016 study. J Clin Oncol. 2017;35(34):3851–8. https://doi.org/10.1200/JCO.2016.72.1985. Lee C-H, Makker V, Rasco DW, Taylor MH, Stepan DE, Shumaker RC, et al. Lenvatinib + pembrolizumab in patients with renal cell carcinoma: Updated results. J Clin Oncol. 2018;36:Suppl 15. https://doi.org/10.1200/JCO.2018.36.15_suppl.4560.